There’s an unsettling disquiet in the wake. Something happened here. The sidewalks are vacant. January isn’t the high tourist season anyway. It’s too rainy and the northward-drifting fog is an unwelcome photo subject. But the devastating wine country fires last October left a daunting recovery task for Santa Rosa. The refuge is the Russian River Brewing Company. “It’s gonna be a while for a table, but the bar’s open,” the host offers as I reach the front of the queue. Pliny the Elder. Blind Pig. STS. Supplication. Consecration. Damnation. Sanctification. 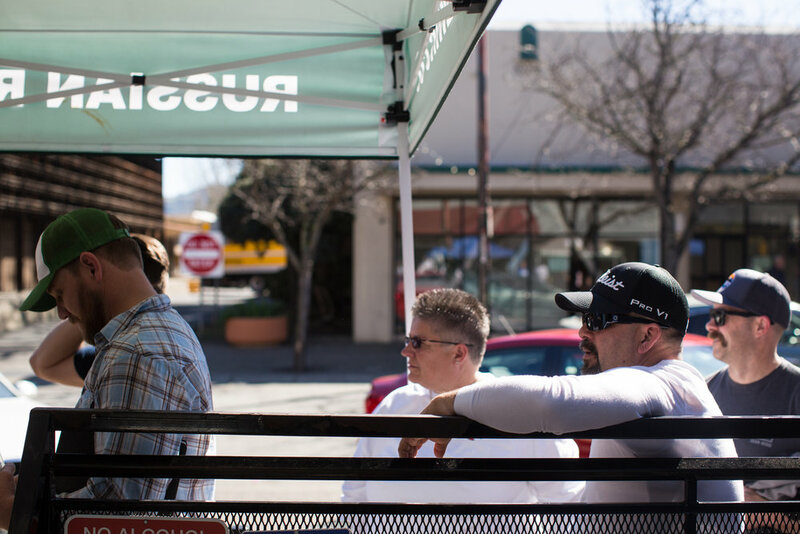 It’s the neighborhood pub here, where hometown folks unbothered by the crowds swing by to grab cases of Pliny for their weekend barbecues. But it’s also a beer mecca, where Russian River’s founders, Vinnie and Natalie Cilurzo, readily pour beers for local residents just as often as for the excitable, starry-eyed obsessives looking for "_____tion" beers on their very first 4th Street pilgrimage. 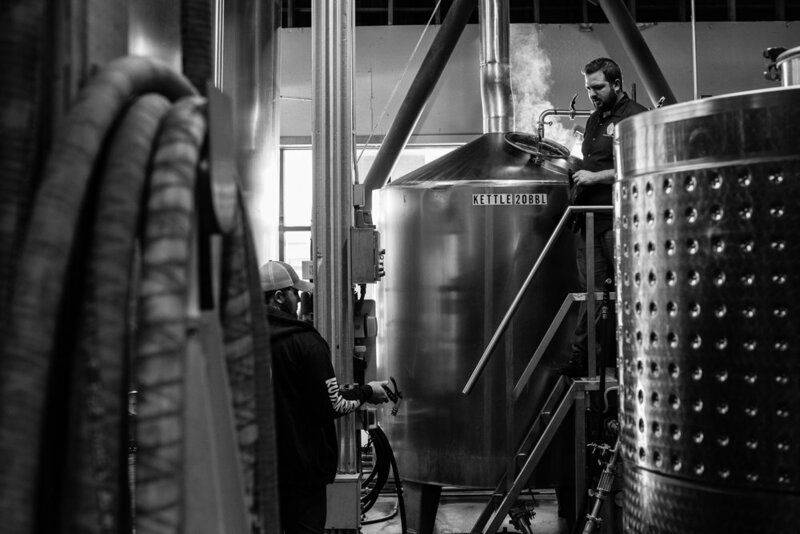 A few miles away is their compact brewhouse, tucked in a quiet, nondescript business park. Bottles rattle down the line as two men package Pliny the Elder. Soon the beers will be placed into folded green boxes and sent off to carefully-selected retailers. This isn’t Russian River’s first brewing system, Natalie explains as we walk into her office with Vinnie. This one replaced one they bought from their friend Sam Calagione years ago. But before that, even before Russian River, all they had was an even more rudimentary system. “Slow growth, organic, grow when it feels right,” Vinnie says. Electric Dave sold Vinnie an old soup vessel for a brewing kettle, a DIY mash tun, and plastic fermenters before he and Natalie—who, at the time, was working full-time at a winery—opened Blind Pig in Temecula in 1994. The equipment, as Vinnie generously describes it, was “pretty rough,” but it was sufficient enough. After rigging it up, they learned how to work with it well enough to impress influential homebrewing author George Fix, who one year had attended a Southern California beer festival hosted by Vinnie’s parents’ winery. In fact, it was through winery connections that she and Vinnie met years earlier. Natalie, a late teen at the time, was working for a winery called Piconi. One day, she and her employer had driven over to Cilurzo Winery—owned by Vinnie’s parents—to buy some produce when she saw Vinnie crushing grapes. The two were introduced that day, but it wasn’t until they found themselves at the same party the next summer that they started talking and Vinnie invited her to his 20th birthday. At the time, he was a homebrewer messing around in his parents’ winery’s drain- and hose-equipped cellar. When they started dating, he found himself with company—Natalie would spend up to three or four nights a week there, talking while brewing and bottling. She brought the Scarcella’s Pizza and, because she was of legal drinking age and Vinnie wasn’t, the beer. Opening a brewery was always the goal, and in 1994, they made it happen—for a while. It did not go very well, but it wasn’t entirely fruitless. “Our first beer at Blind Pig was the Inaugural Ale, which is now supposedly the first double IPA,” Vinnie says. Asked to put tasting notes to the admittedly unbalanced Inaugural Ale, Vinnie describes the taste of the relative monstrosity as comparable to “licking the rust off a tin can.” It was aged on American oak chips because, as a winemaker, he believed the tannins from them would contribute astringency and dryness to the beer. He was right, too. Too right, even—it proved excessively bitter. And then he one-upped himself by double dry-hopping it, too. He pauses. “Did it work?” I ask. Vinnie’s methods proved too ahead of the curve, and Blind Pig hit financial trouble. He’d seen his parents work themselves hard at their winery (in addition to his father’s job as an Emmy-winning lighting director for Merv Griffin), and didn’t want to see his career become equally demanding. But after three years, it didn’t look like Blind Pig’s business would improve, so the two, by now married, sold his stake in the company and drove north. Natalie, with an already impressive résumé in wine, found a job quickly. Vinnie also lined up two job offers. One was with Benzinger Family Winery, which had decided to open a brewery they were calling Sonoma Mountain. It had the job security going for it, at least. Benzinger offered a full-time position, but Vinnie would have had to make primarily Lagers. “Not really Vinnie’s thing,” Natalie says, so he went with his other offer from Korbel Champagne Cellars. Though he had already won a few Great American Beer Festival medals with Blind Pig, Vinnie piled on those, and brought home more for his work with Russian River, including the prestigious "Small Brewing Company of the Year" and "Small Brewing Company Brewmaster of the Year" in 1999. As Heck recalls, the honors were proof that he was onto something. “Vinnie could make an excellent product,” he remembers. A year later, Vic Kralj, influential owner of the The Bistro in Hayward and eventual co-founder of what became San Francisco Beer Week, presented Vinnie with a challenge: Make the best double IPA in the Bay and bring it to their new festival, 15 miles south of Oakland. Kralj explains that he and his friend had noticed local brewers experimenting with Double IPAs. The Bistro already had an IPA fest, but Kralj thought, why not a Double IPA competition too? You might say the man was a little ahead of his time. Now, 18 years later, he says Pliny is still his best-selling beer, and praises it as “the quintessential double IPA, so well-balanced, so easy to drink, but with alcohol in it.” He doesn’t remember if Russian River took gold that year, but says that, over the years for the fest (which now brings in over 100 brewers), Pliny has won several times. But back in 2003, for all the hardware and acclaim Russian River was earning, it wasn’t enough to keep the experimental operation running. That year, Korbel followed financial advice to shutter the brewery. The company offered Vinnie a winemaking job, with benefits and potentially up to six figures in annual salary, but he’d already been mulling an alternative plan. A week later, Vinnie took his negotiations to Korbel and, in lieu of a severance, took the company name and beers the company had become famous for, including Damnation, Temptation, Salvation, and Pliny the Elder. “We gave Vinnie a good deal on the name,” Heck says. After almost exactly a year of fundraising, the Cilurzos opened their downtown Santa Rosa brewpub. It was actually two properties, together totaling 7,100 square feet, and it required serious labor to take it from an old, carpeted English pub to what would become a small brewhouse and taproom. They didn’t have the cash to hire contractors, so they DIY’d the space themselves. Vinnie jackhammered the floor, and they fashioned tables out of bowling lanes. But the plan was moving. Then-Kendall-Jackson CEO Lew Platt, who Natalie had previously worked for, helped pen their business plan (and, subsequently, became their first investor), and about 30 family members and former co-workers followed suit, investing a total of $850,000 to get the now independent Russian River off the ground. The Cilurzos brought on two people to run a food program (“In the end, it was the best decision to open a restaurant,” Vinnie recalls. ), and by the next year, they were already buying back equity. 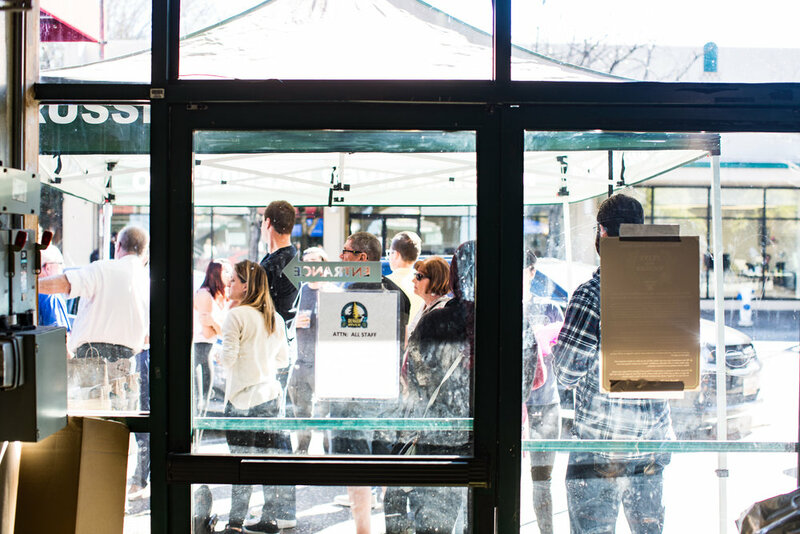 One unassuming February morning in 2010, Vinnie saw people lined up outside the brewhouse on his way in. Perplexed by the crowd, he singled out someone in line to ask what was going on. Pliny the Younger, Russian River’s soon-to-be storied Triple IPA, was ranked No. 2 in the world on RateBeer and BeerAdvocate. Vinnie had never heard of either. In any case, it was a bad day for a business boom. He was so sick that night he began coughing up blood and had to visit the emergency room. Natalie was nursing a recent knee surgery. Unable to move around easily, she leaned up against the counter to fill growlers of Younger—something they’d never again do after this day—and ended up soaked in Triple IPA. They had given “the worst” customer service and their kitchen couldn’t keep up with the orders. They ran out of Younger in eight hours. Years later, the Younger release is now a meticulously orchestrated event. The Cilurzos spend thousands of dollars on extra security, customized stamps, city event permits (necessary for lines that stretch the block), and branded wristbands featuring their logo and three pull tabs—one for each pour of Younger a guest is allowed to buy. A lot of extra money is also thrown at Younger on the production side. It’s a more stunted yield. Where a normal batch of Russian River beer will produce 16 barrels, Younger only makes 12, due to the excessive hops used. But despite the upfront cost, Younger’s ROI is worth the hassle, and not just for the brewery. The annual two-week release event has become so lucrative for the brewery’s surrounding hotels and restaurants that Sonoma County has twice measured the economic impact of the Pliny the Younger release. 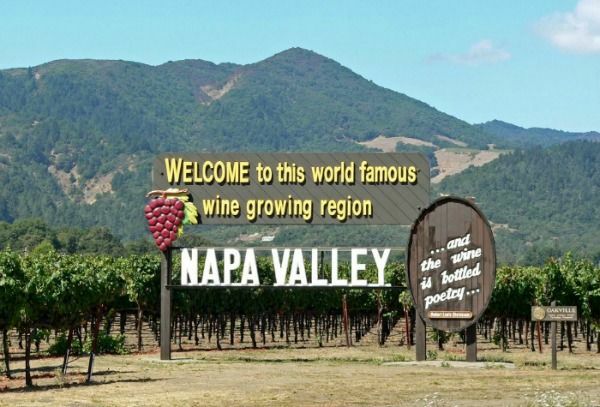 In 2013, the release’s 12,500 attendees from mostly outside Sonoma County generated $2.36 million for the region. Just three years later, the amount earned for the area shot up to $4.88 million. Around 16,000 people came from around California, the country, and the world, from as far off as Japan, Spain, and Brazil. All for three small pours of a world-famous Triple IPA. “It was quite the increase since 2013, but it does reflect what the economy is doing,” says Francesca Schott, Business Services Coordinator for Sonoma County. Schott says that the bounce back from the recession has helped draw consumers to spend money at such an event, and that the county also honed its measuring tactics in the meantime. It was going to be business as usual in the preparation for the 2018 Younger release, but on the evening of October 8, 2017, around the time Russian River would start to shift around beer production plans to brew Younger, everything changed. Vinnie and Natalie had just arrived home from the Great American Beer Festival in Denver, but Natalie couldn’t sleep—she kept waking to the smell of smoke. She’d seen on the news earlier that flames were flaring near Calistoga, but being high fire season in California at the time, it didn’t seem immediately dangerous. But at 4 a.m. she awoke again to Vinnie already sitting up in bed, alarmed. They turned on the news to see that the "smoke and ash and wind and terror" had spread to Santa Rosa. The city’s Coffey Park neighborhood was leveled. More than 40 people died as a result of fires that blazed across 250 square miles (equal to more than five times the size of San Francisco), and Santa Rosa residents alone lost 3,000 homes. Their house, their brewpub, and the new brewhouse under construction in Windsor, up the road, were fine, but at the time they were primarily worried about their staff. Some of their employees lost their homes. Some of their fellow brewers fled burning homes, too. Their good friend Brian Hunt, who founded Moonlight Brewing and has fire-fighting training, headed toward danger and personally butted out new flames with a shovel and nearby garden hoses. Natalie and Vinnie mobilized, and began dialing their lawyers to devise a recovery fundraising plan. What they came up with was two-fold: First, they contacted dozens of breweries, maltsters, and hop growers they were friendly with to ask for donated time, resources, packaging, and selling power to help them raise money under a license they owned called “Sonoma Pride.” It wasn’t long before word spread and breweries started calling them. By the end of the campaign, more than 60 beer makers, some as far off as the UK’s Beavertown and Florida’s Cigar City, were producing Sonoma Pride brews. The second part of the plan was difficult to execute: hold a raffle to skip the famously hours-long line for the Pliny the Younger release. One winner, Natalie says, was a local and opted to donate his prize to a firefighter whose kids lost all three of their homes—the firefighter’s home, his ex-wife’s, and his girlfriend’s—while he was battling flames. “I told him he could bring three guests and I’m not going to let them pay for a thing,” Natalie says. The raffle, which they had to cut off, raised $114,000, but the fundraiser as a whole brought in a million dollars and counting. And yet, for all the good work, and recovery efforts underway in Santa Rosa, Vinnie isn’t convinced it will be enough to attract folks back to the area. “It’s like Natalie says, the two things we can’t predict are the weather and how many people show up [for Younger],” he says. “This could be the year that with everything that’s happened—the fires, tourism is down, 5,000 families [across the region] have lost their homes and they don’t have friends coming—we just don’t know. But we’ve always approached it from a very cautious side, [and] our staff doesn’t take it for granted. Russian River’s brewpub has always had one strict rule: “Our hours are our hours.” Sonoma County is, and it has been, back in business, ready for tourism to pick back up. Now, they’re just waiting for everyone to return. One way to revive beer tourism in the area may be a brand new facility that the Cilurzos are literally building from below the ground up. A massive brewhouse set to open in nearby Windsor, Calif. will allow them to produce up to 70,000 BBLs—a big jump from their current 17,000 BBLs—if they want. And only if they want. It’s a massive undertaking, not made easier with the Sonoma Pride campaign and Natalie’s recent re-election to the board of the California Craft Brewers Association, but they don’t seem too worried about having long to-do lists. It may be that keeping that pace, and even struggling, is an important component of the Russian River model for success, too.